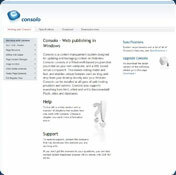 Consolo is a content management system for managing contents on web sites. It gives you control and overview over your web sites and handles all modern technologies such as html, xhtml, xml, databases and Flash. It is based on a client program communicating with a server part. The client is designed for Windows 2000/XP and the server part works on both Windows 2000 and Unix/Linux servers. Consolo is designed mainly for developers who use the program for free, can modify it to suit specific needs and even sell it to their clients. The sleek, modern design makes Consolo easy and enjoyable to use both for advanced developers who tweak it into what they want and end users with less interest in computer work. Thanks to it's client design, Consolo offers features such as drag-and-drop of contents from your computer directly onto your web site (with batch-dragging of course), and editing of content in your favorite programs (e.g. UltraEdit, Photoshop, Flash) - when you save, the web site is directly updated. Download and set it up on your existing site or use the included designed template. Consolo won't take over your web site and can easily be deployed if needed. Online you will find an extensive developer's section and all the necessary user manuals. You cannot download any crack or serial number for Consolo CMS on this page. Every software that you are able to download on our site is legal. There is no crack, serial number, hack or activation key for Consolo CMS present here. Our collection also doesn't contain any keygens, because keygen programs are being used in illegal ways which we do not support. All software that you can find here is freely downloadable and legal. Consolo CMS installation package is prepared to be downloaded from our fast download servers. It is checked for possible viruses and is proven to be 100% clean and safe. Various leading antiviruses have been used to test Consolo CMS, if it contains any viruses. No infections have been found and downloading Consolo CMS is completelly problem free because of that reason. Our experts on malware detection tested Consolo CMS with various spyware and malware detection programs, including fyxm.net custom malware and spyware detection, and absolutelly no malware or spyware was found in Consolo CMS. All software that you can find on our servers, including Consolo CMS, is either freeware, shareware or open-source, some of the software packages are demo, trial or patch versions and if possible (public domain licence), we also host official full versions of software. Because we want to be one of the fastest download sites on the web, we host all the software including Consolo CMS on our servers. You cannot find here any torrents or download links that would lead you to dangerous sites.